In 2007, Kanawa officially became a certified Kimono consultant of All Japan Kimono Consultant Association after graduating from Sodo Reiho Kimono College. This certificate is approved by the Ministry of Education/Science and Economy/Industry. Since then, she has been offering Kimono dressing services, instructing Kimono classes/workshops, and producing Kimono fashion shows/dressing demonstrations. She also works as a Kimono model, treasuring six years of classical Japanese dance training under Hanayagi style under the instruction of Hanayagi Wakana sensei. In the same year, she became a professional Edo Tsumami Kanzashi artisan through intensive training by a designated master, Kazuyo Hozumi, one of only a few designated Edo Tsumami Kanzashi artisans in Japan. As a successor to preserve this disappearing traditional handicraft, she creates both traditional and modern designed Tsumami Kanzashi, including custom orders. Her beautiful creations can be purchased online at http://atelierkanawa.com. She occasionally participates in arts and crafts shows. She currently offers ongoing workshops at the Japan-America Society of Washington D.C. In early 2013, she founded the Washington D.C. Kimono Club. The club welcomes her Kimono class students, who love and sincerely respect Kimono, Japanese seasonal culture, and Japanese custom/manners. 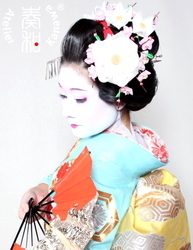 Members can participate in Japanese seasonal cultural events in Kimono, attend Washington D.C. Kimono Club's special workshops, and model at her Kimono fashion shows/dressing demonstrations.